Numbers of cases of carbon monoxide poisoning by age group. 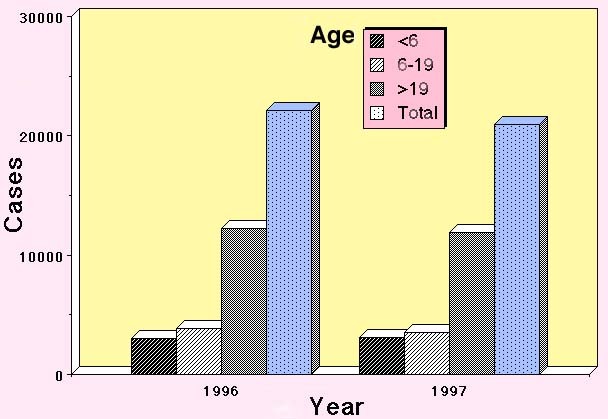 ........ Data for 1996 and 1997 from the Annual Report of the Am. Assoc. of Poison Control Centers, Toxic Exposure Surveillance System (published in the American J. Emergency Medicine). Statistics reported to 67 reporting centers for the two years. The total number of poisonings in 1996 were 22,154, and in 1997, 20,930. For children less than age 6 the numbers were 3,029 and 3,116; for children age 6-19 the numbers were 3,814 and 3,530; and for adults (>19 years), the numbers were 12,220 and 11,869.